At 9:30am, after watching the sunrise from our orange mattresses on the 3am train from Tangier, the city of Marrakech greeted us with a mass of pink houses and a wave of heat. Wiping our eyes and lugging our suitcases, we shuffled into taxis and arrived to our air bnb on the outskirts of the city. Stunned by the orange trees and tea awaiting our arrival, Eran, Sara, and I had to work to peel off our dirty clothes and get ready for our day of interviews. Using my broken Moroccan Arabic, I asked a young woman on the side of the road where we may find a bus into the medina, as we were itching to avoid the bartering necessary for taking a taxi. She waved me to the other side of the road, where the three of us waited in the blazing heat for a minivan to stop and pick us up. With an array of hand motions and head nods, we managed to signal that we intended to go to MACAAL, The Museum of African Contemporary Art Al Maaden. The Museum is dedicated to the promotion of African contemporary art through its continuous support for leading artists from Morocco and neighbouring countries and the public display of their works. 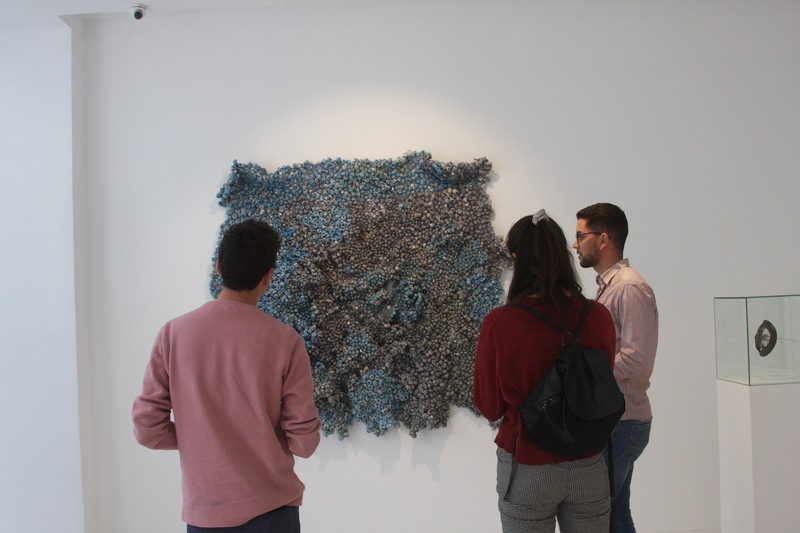 The museum’s collection, consisting of digital art, painting, sculpture and video, illustrates the Fondation Alliances’ commitment to providing universally accessible contemporary art, while supporting cultural development in Morocco. According to MACAAL's president, "Our mission is to disseminate, educate, and popularize art in Morocco and within the continent, namely among younger audiences. We believe that culture is a shared asset that can be an outstanding lever for development." Arriving at MACAAL, we were welcomed by a tour through the gallery, featuring highly political contemporary art, making statements on female genital mutilation in South Senegal and British colonialism in Zimbabwe. I scrambled to take notes as Sara snapped photos of the artwork. After the tour, the museum’s artistic director, Meriem Berrada, ushered us into her office and explained the mission of the museum, why Marrakech has become Africa’s artistic capital, and the issues found in the Moroccan art market today. We thanked her, and Eran bought the exhibition booklet, so that we would be able to look more deeply into the pieces we had just seen. After exploring the museum’s garden, it was time for our next interview with Professor of Anthropology at the National Institute of Archaeology and Heritage Sciences, Ahmed Skounti. Professor Skounti is also an associate professor at the University of Marrakech, and he was the Focal Point of World Heritage in Morocco from 2000 to 2014. He contributed to the drafting of the 2003 ICH Convention and is a facilitator of the UNESCO ICH capacity-building programme. He was chair of the Evaluation Body of the UNESCO Intergovernmental Committee for the safeguarding of the intangible cultural heritage in 2015 and 2017. He is a member of the Advisory Body of the International Research Centre for the Intangible cultural heritage in the Asia-Pacific Region (IRCI, Japan) and of the Arab Regional Centre for the World Heritage (ARC-WH, Bahrain). He is also a member of the Scientific Board of the International Journal of Heritage Studies. We rushed to the cafe he where we were to meet him, and waited, smoothies in hand, rapidly writing down burning questions for our next interview. Professor Skounti arrived with an eager smile on his face and joked about our request to record the interview. He explained his work with UNESCO, and we told him about our trip to Ceuta only one day earlier, discussing the significance the city held in terms of both migration and colonial history. Once the recording device was turned off, we discussed if there was actually such a thing as “tradition” or if it was a constructed idea. As we concluded the interview, he said we could email him with any questions and to let him know how our research progressed. In the meantime, Uzair, Vinny, Reed, Esra, and Ezgi had arrived to Marrakech from Fes and, bags in hand, rushed off to their interview with the High Atlas Foundation. The High Atlas Foundation (HAF) is dedicated to catalyzing prosperity and endorsing grassroots development with disenfranchised communities throughout Morocco. HAF aims to empower social groups to identify, implement, and sustain projects that are most beneficial to them. Exhausted, we all met back up for dinner for our first night in Marrakech, laughing about our time apart and sharing the differences we noticed between Fes and Tangier. It is 12am, and I have just arrived back at our home for the next few days, finally able to take a long awaited deep breath and reflect on the past week’s events.